Another Big E is over, and as usual, all the Granges came through with flying colors. All six states say, "Thank You!" Now it's time to start creating all over again- a good way to keep from being bored. Our regional meetings are underway. There are still two in November - on the 7th at Good Will and on the 14th in Cheshire. This year's theme is "Catnip Capers." Guess you know who likes cats. Judging will take place on Friday, July 23, 2010 in Cheshire Grange Hall. Items will be left and judged in private. At 11:00 A.M. on Saturday, July 24, all items will be displayed, with awards, for public viewing. This way, the judges will not need more helpers. Mark your next year's calendar so you will have the day open. Our ten classes in the needlework contest remain the same. We will again include the Dress-A-Doll category. This is only for our state and members of the Grange. A great big thank you to all who made "Cat Nip Theme" gifts. Those were for Foster Families. They were pajamas, toothbrush, and toothpaste in a cloth bag, sizes from babies to teens. Also, we can't forget all the gifts for Covenant to Care. It's always very heart warming to see the racks filled with gifts at State Session. Keep up the wonderful work. Keep those hands busy, and needles flying, working on items for the Needlework and Craft Contests. 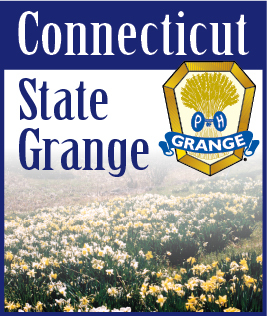 Remember, when you have all that craft and needlework material out, please make an extra item for the Grange Country Store in the New England Grange Building at the Big E. It will be greatly appreciated.